The Scripture Lady will perform over 30 times this Easter season! It’s true! And she would love your prayers for strength and God’s hand to touch many hearts with the gospel of Jesus Christ. April 2019 is going to be a banner month for my ministry! 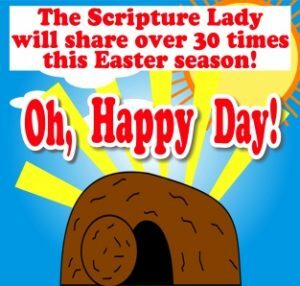 The Scripture Lady will perform over 30 times this Easter season! What a blessing it will be to share the good news of the true meaning of Easter to hundreds of children. I debuted my newest preschool Easter program on March 27th. It is filled with 8 creative ways to captivate young hearts with the truths of God. I will debut my elementary Easter program on April 12th, which will also showcase many creative elements. The program opens with my puppets Jack and Jill singing along with my “Easter is Coming” song. Jack and Jill and the children will be reminded that Easter is NOT about bunnies, eggs or basketfuls of candy. Instead, Easter is all about Jesus giving His life for you and me. Next comes a brand new song that I call the “Gospel Cube” song. Many of you have probably seen the Evangecube for Kids. It is a creative cube that share the gospel as you flip it this way and that. Here is a picture of the Evangecube made by E3 Resources. When I saw this cool looking square, I thought to myself, “I need to write a song for this fun tool.” And so, I did. After the “Gospel Cube” song comes a new Bible Story Sticks story that I call “What Did Jesus Do when He was On Earth?” It gives a quick synopsis of some of the most important events of the life of Jesus, culminating in His death and resurrection. Then it’s time for a Bible Story Tapper game to help the children learn what sin is. This is a fun game that uses visuals and a fun poem to help them learn about sin and why Jesus had to die for the forgiveness of our sin. For my object lesson with a magical twist, I have revamped a lesson that I saw on YouTube all about how Jesus washes away our sin. It’s a very effective visual way to show the kids that only Jesus can wash away our sin when we believe in Him. Up next, for the second time since it’s debut at Christmas, I get to bring out my “Bible Story Suitcase.” This time, I invite the children to travel with me to Jerusalem where Jesus gave His life upon the cross. During this creative form of storytelling, I get to sing my original song “Oh, An Angel” that lovingly shares this amazing part of the Easter story. No program would be complete without a visit from Scruffy who learns that because He trusts in Jesus, his heart is filled with the love of God. And finally, the program closes with a visit from Scripture Granny who gives a rousing rendition of the classic hymn, “O Happy Day!” You don’t want to miss it! 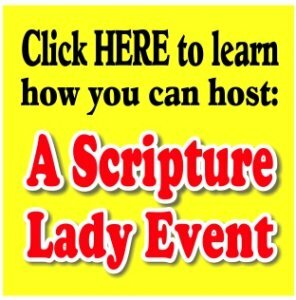 If you liked this article about how the Scripture Lady will perform over 30 times this Easter season, then sign up to receive Scripture Lady’s Free Email Kid Tips packed full with creative ideas and receive 12 FREE Bible downloadable resources to help get the kids you minister to excited about the Bible! Just go to www.MyFreeBibleGames.com to fully subscribe.